Colorado Mountain Express, a subsidiary of Vail Resorts, has been granted a conditional-use permit to convert office space into more workforce housing units at 224 Annie Road in Silverthorne. The existing building features three second-floor apartments and commercial space on the first floor. The plan is to add two more four-bedroom apartments on the ground level. Colorado Mountain Express, a subsidiary of Vail Resorts, has been granted a permit to convert a mixed-use property the company now owns in Silverthorne into workforce housing. The two-story building at 224 Annie Road, north of Interstate 70 off the Blue River Parkway, was originally zoned as a commercial property with residential units on the second floor. It is split about 50/50, with 3,000 square feet of office space on the first floor and three apartments at roughly 2,900 square feet combined on the second. Two of them are four-bedroom units, and the other is a two-bedroom. The plan to remodel the building calls for converting much of the downstairs office space into living quarters by adding two more four-bedroom apartments — or another eight to 10 beds — in a similar layout as the existing upstairs apartments. A small commercial space on the first floor will be preserved “as required under the zoning,” according to the permit application. In a Tuesday news release, Vail Resorts touted the $440,000 it’s spending through its subsidiary on the Silverthorne project as part of the company’s $30 million commitment to workforce housing, first announced in 2015. Since that announcement, Vail Resorts has started building a $6 million workforce housing project in Keystone, and the company is working on another large-scale housing project on 23 acres of land off the East Vail exit of Interstate 70 in Eagle County. The $30 million workforce-housing commitment is said to apply to Vail Resorts’ properties in Colorado, California and Utah. According to the company, it now owns or leases about 3,000 beds across just Eagle and Summit counties. In comparison, the town of Breckenridge has committed more than $45 million for workforce-housing projects since 2015, including Pinewood 2, Huron Landing, Blue 52 and the Denison Commons, according to town officials. In addition to the ski resorts at Vail, Breckenridge, Keystone and Beaver Creek in Colorado, Vail Resorts also runs ski resorts in Utah, Michigan, Minnesota and California while managing lodging properties, retail outlets, transportation and real estate in nine U.S. states and three countries. Altogether, Vail Resorts employs more than 26,000 people across all of Vail Resorts’ many assets, and according to the company, more than half of those employees are millennials, putting them under the age of 40 and in a demographic that’s often sorely in need of housing at these high-priced resort communities. The Silverthorne site seems like a good fit for the small-scale housing project, aside from a few niggling points, such as it being two parking spaces short of the required minimum and not all of the existing 15 parking spaces that are currently there have the required curbs, bumpers or wheel stops. Next to the property are large retail, wholesale, office and second-floor residential units, and town staff do not expect the shift to first-floor apartments to have any adverse effects on the existing businesses and homes. 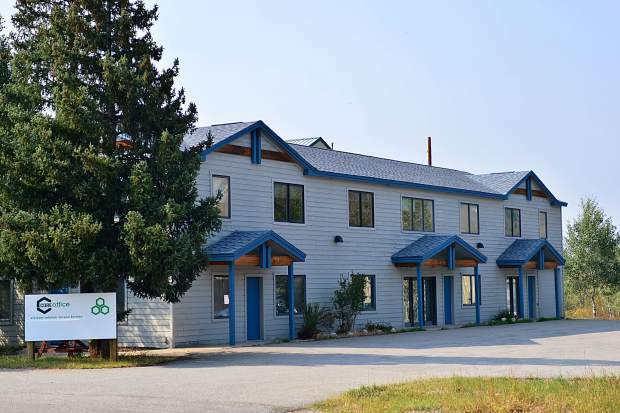 As such, town staff determined the site plan is in line with Silverthorne’s comprehensive plan and should help the town meet its goal of providing affordable housing near local transportation systems because the building sits within walking distance of the closest bus stop. The town approved the permit Aug. 23. It is nontransferable and hinges on the 15 parking spaces being marked with curbs, bumpers or wheel stops. The town is granting a variance for the two missing spaces, the lack of which isn’t expected to cause problems. Additionally, per the permit, none of those parking spots may be used for trailers, boats, campers or anything else that could render them unavailable for vehicles. The town is also requiring CME to put out bike racks with enough space for at least seven bicycles. Historically, CME has found that about a quarter of its employees don’t have vehicles and utilize other modes of transportation, according to its permit application. CME also must run a shuttle to and from the building at 224 Annie Road for workers going to the operations center at 273 Warren Ave.
Vail Resorts is currently completing design plans for the Silverthorne project and intends to submit a building permit application this month.